Joe Theismann led the Redskins to a win in Super Bowl XVII and an appearance in Super Bowl XVIII and would go on to set several Redskins franchise records, including most career passing attempts (3,602), most career passing completions (2,044) and most career passing yards (25,206), while also throwing 160 touchdown passes. He was the NFL's MVP in 1983. 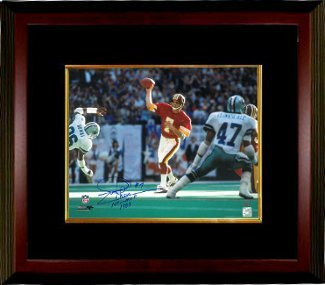 Joe Theismann has hand autographed this Washington Redskins 16x20 Photo with NFL MVP 1983 inscription. Leaf Hologram and Certificate of Authenticity from Athlon. 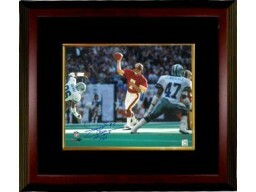 Custom Black Mat and Premium Mahogany Color Framed as shown.